It is estimated that there are over 40,000 species of spiders worldwide. Spiders are arachnids, not insects. They have eight legs and two basic body parts – the cephalothorax and the abdomen. The body part (cephalothorax) contains the eyes and fangs and is where the legs are attached. The abdomen contains the spinnerets, which are used for spinning spider webs. Most spiders have eight eyes in two rows (four eyes per row). In the pest world, spiders are actually beneficial insects that eat other insects. House spiders are the most commonly encountered spider inside residential spaces. House spiders typically occupy upper ceiling corners, closets, windows and above or below furniture. House spiders build large webs and prey on other insects. House spiders rarely bite unless provoked. They are more of a nuisance and do not pose an actual real threat. Garden spiders are found outside in gardens where they build strong webs to trap prey. Garden spiders do not display aggressive behavior and are not likely to bite. In the rare case that a garden spider is threatened enough to bite a human, its bite would be harmless. Black Widow spiders are black in color with a signature red hour glass on the underside of the abdomen. Contrary to common belief, female black widow spiders do not eat the male black widow spiders after mating. Female black widows are more dangers than male black widows, in that the venom from a female is stronger and they are more aggressive and likely to bite. Black widows often build webs in dark and protected areas like sheds, barns, garages, firewood, boxes and other undisturbed locations. Black widows lay approximately 300 eggs per egg sac and lay about 10 egg sacs over a lifetime. Black widow venom is a neurotoxin and a black widow spider bite can cause extreme pain. Children and the elderly are vulnerable to reactions from black widow spider bites. Brown widow spiders were first identified in southern California a little over 10 years ago. The brown widow has a brown and tan striped pattern on its abdomen with an orange-colored hourglass. Like their relatives the black widow, brown widows also establish webs in secluded areas such as empty boxes and containers, fences and the underside of outdoor furniture. Brown widow spiders lay approximately 120-150 eggs per egg sac and lay about 20 egg sacs over a lifetime. Brown widow venom is also a neurotoxin, however, according to the University of California Riverside, brown widow spiders are not capable of injecting as much toxic venom compared to black widows. Brown Recluse spiders are medically significant; however they are not established in California and are instead found in the southwest portions of the United States. Spiders venture indoors when exterior food sources become scarce. Most spiders are nuisance pests and not medically significant, excepting certain species such as the black widow spider and brown recluse spider that have toxic venom. Rather, spiders produce psychological reactions in people who are fearful of spiders and do not want them crawling around their landscape or the interior of their home. Spiders rarely bite people and usually do so when they are threatened. 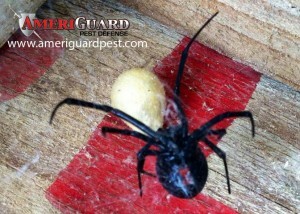 AmeriGuard Pest Defense offers spider control services to residential and commercial locations. Spider treatment services are available on a Monthly, Bi-Monthly and One-Time basis. Residential customers on a regularly General Pest Control Maintenance Plan will automatically be covered for spider control during regularly scheduled services. Your service technician will dust for spider webs at each and every visit. Eliminate clutter to reduce hiding spots in garages and undisturbed corners of a structure. Use caution when inserting hands and feet into seasonal items such as roller skates, gardening gloves and other items stored in garages and sheds. Contact your spider service experts at AmeriGuard Pest Defense for a spider treatment quote. Most quotes for spider services can be provided over the phone without any obligation. AmeriGuard Pest Defense’s General Pest Control Maintenance Program will include control of spiders. No contracts required! Both the interior and exterior of your structure is always under guarantee. AmeriGuard Pest Defense’s General Pest Control Maintenance Program guarantees your satisfaction between regularly scheduled pest control services with unlimited free treatments as long as regular services are maintained. If at any time your residence requires an additional treatment in between services, call us and we will schedule a convenient time to treat the problem at no cost to you. Both the inside and outside of your home are always under warranty. AmeriGuard’s Spider Defense Program guarantees your satisfaction between regular scheduled maintenance with unlimited free re-services. If at any time you find yourself in need of an additional treatment between regular scheduled services, call us and we will return to re-treat your home absolutely free!